Battery Optimizer ($30, feature-limited demo) is a small application designed to perform various tasks that improve battery life on a laptop PC. The first thing it does when you start it up is provide a nice big graphic detailing battery life in percentage and time. It calculates battery life its own way rather than relying on Windows' estimates, and Battery Optimizer seems to be more accurate in that respect. Even on a newer laptop, the battery life savings from using Battery Optimizer can be significant. Next, Battery Optimizer asks to run a diagnostic, which tests the laptop's WiFi, Bluetooth, infrared, brightness, and external peripherals settings, all in an attempt to give you back some of that precious battery life. The test can take anywhere from the stated 7 minutes (on the older of the two laptops I tested) to up to 20 (on the newer laptop). Once the test is done, a simple chart appears showing you how much battery life you'll gain with Battery Optimizer's optimizations. In one test on the newer Toshiba laptop, it won back 28 minutes, which is not insignificant. (This laptop had Bluetooth turned on unnecessarily, which was eating up the battery.) On another test on the older Dell laptop, the gain was only 8 minutes. 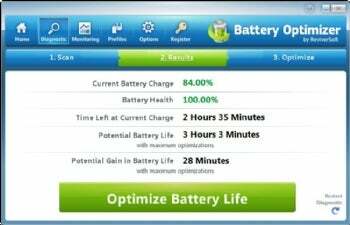 What Battery Optimizer doesn't tell you before you click the big green Optimize Battery Life button, is what exactly it's going to optimize to improve that life. Before I have an app muck about with my system settings in an effort to help me, I like to know exactly what it's doing. However, it's pretty easy to discern that the optimizations are based on the tests it just ran: WiFi, Bluetooth, screen brightness, and so on. Once I did click Optimize Battery Life in the demo version, I got a nag screen telling me to register. This demo version therefore doesn't have any functionality--but I tested the registered version as well, and it did indeed optimize the laptop to improve battery life. This is a handy app to run just before going on a plane, for example, as it'll let you kill the WiFi and Bluetooth, dim your screen, and even remove a few CPU-hogging processes--all with a couple of clicks, and the optimizations only take a few seconds. Searching Control Panel to disable this stuff would take several minutes--longer if you didn't know where to go. Keep in mind that many laptops four or more years old can only be dimmed by hand only and not from an application, so as far as that specific bit of optimization goes, all Battery Optimizer can do is recommend you dim your screen. Hitting Fn + down arrow will do the trick. In conclusion, Battery Optimizer doesn't do anything that you couldn't do yourself with a little know-how. It simply makes optimizing your battery life much faster and more convenient. If you feel like that's worth your $30, then go for it. Note: This is a demo version. The full version costs $30, and adds the following features: fast and easy battery optimization, advanced battery usage monitoring, battery usage alerts, and longer battery life.